As Europe moves to stem the flow of incoming refugees amid fears of another Islamic State attack, many Syrians remain determined to risk the perilous journey. Sunday, the European Union pledged Turkey $3.2 billion in return for helping stem the flow of migrants to Europe. The deal was reached amid heightened security concerns after the terrorist attacks on Paris and the subsequent lock down in Belgium. With EU countries divided over how to address the situation, and some politicians demanding an immediate closure of borders, there are fears anti-refugee rhetoric may be the cause for a spike in violence. Having fled violence in Syria this summer, 23-year-old Muhammad is aware of the potential implications of the Paris attacks. Set to fly from Lebanon to Turkey before searching out people smugglers to help him get to Greece, he said he had seen footage shared among his Syrian friends of a group of men he claims are French attacking “people who look Arab.” VOA was unable to verify the footage. The Collective Against Islamophobia in France claimed it had received a sharp increase in calls reporting anti-Muslim violence in the week following the Paris attacks, while some other European countries have registered a steady increase in violence perpetrated against refugees. Figures released by the German government reveal there had been 576 crimes this year against Syrian refugee centers in Germany, compared to 198 during 2014. “We’ve seen over the past year that there have been increases in racist attacks targeting refugees and migrants,” said Georgina Siklossy, spokeswoman for the European Network Against Racism. Many across Europe have sought to defend refugees, with activists pointing out that the vast majority of those directly involved were European nationals. Muhammad, who fled his hometown of Hama, is hoping to reach Germany and receive a friendly welcome there. Fearful that more border measures will make his life tougher in the coming weeks and months, he is rushing to make the journey to Greece by sea. Muhammad tries not to think about the risk of a journey that has claimed more than 3,500 lives this year. Many others continue to take similarly calculated risks, despite sharing concerns the reception in Europe may be less friendly than before the attacks. Europe’s pull is strong even for the many who have escaped the violence of Syria to neighboring countries only to enter a new kind of struggle. In Lebanon life is becoming tougher for refugees, whose numbers are thought to be around 1.5 million. With many living in abject conditions, this year life became even harder as the Lebanese government imposed stricter measures on refugees in an effort to reduce their numbers. The recent measures have acted as a “push factor” for refugees to leave the country, claimed Fawzi al Zioud, head of the International Organization for Migration's Lebanon office. “It can be difficult to stay in Lebanon because the lack of support, the lack of access to labor markets, the lack of opportunities for a residency,” he explained. Having spent three years in Lebanon, Ali, an NGO worker based in Beirut, is all too aware of these problems. He is among the growing number of Syrians who have found themselves illegal as their papers expire under the new rules. “The situation has changed from bad to worse”, said Ali, who is preparing to apply for refugee status in France. He met reports of tougher measures and incidents of violence against refugees with a shrug. Lebanon has yet to come up with a solution to its refugee crisis. 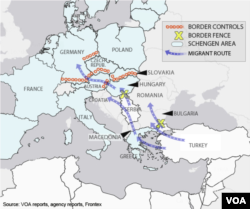 But as heightened security concerns further complicate the calculations of European countries regarding how best to respond to the continuing arrival of Syrian refugees, Zioud suggests further efforts to help Syria’s neighbors would be well-placed.